Metro will continue it’s long standing tradition of offering commuters free rides on Christmas Eve and New Year’s Eve, and will offer “enhanced” rail and bus service for commuters trying to get to the Rose Parade or Rose Bowl Game on New Year’s Day, the transportation agency announced this week. Riding a Metro rail line or bus can help commuters avoid the stress of fighting traffic, Metro said, encouraging people to take advantage of the free service. Free rides will be available from 9 p.m. until 2 a.m. on all Metro bus and rail lines on Christmas Eve, Dec. 24. The regular Sunday/Holiday schedule will be followed on Christmas Day. Bus lines that do not operate on Sundays will not run on Monday, Metro said. On New Year’s Eve, Dec. 31, Metro Bus will operate on a regular Sunday schedule. Metro Rail will run every 12 minutes on all lines with overnight, 24-hour service. Free fares will be in effect from 9 p.m. to 2 a.m. After 2 a.m., transit riders will need to TAP to ride. Metro Rail will run every 20 minutes from approximately 1 a.m. to 5 a.m. The regular Sunday/Holiday schedule will be in effect on New Year’s Day. The Metro Gold Line will be the best way to get to the Pasadena events, as numerous Metro bus lines along the Rose Parade route will be detoured or split into two segments at Colorado Boulevard until streets are reopened, Metro said, adding that there are multiple stations that serve the parade route in Pasadena, including Del Mar, Memorial Park, Lake and Allen. Free bus shuttles from the Parsons parking lot to the Rose Bowl are easily accessible from Memorial Park Station, Metro said. While free fares are in effect, fare gates will be unlatched and anyone who accidentally taps their TAP card will not be charged. Metro’s one-way fare is $1.75 with two hours of free transfers. Metro Day Pass fares are valid until 3 a.m. the following day. A pair of train-vehicle collisions five hours apart on the Metro Gold Line in Highland Park Wednesday resulted in at least one injury. The first crash happened about 1 p.m. between the Highland Park and Southwest Museum stations. Paramedics were sent to the 100 block of North Avenue 52, according to Erik Scott of the Los Angeles Fire Department. Three people were examined at the scene and one of them, who had been in the car, was taken to a hospital for treatment of a non-life-threatening injury, Scott said. “The vehicle was pinned between an abutment and the train,” Scott said. Authorities arranged for buses to shuttle rail passengers around the affected area. The tracks were cleared and service resumed about 3 p.m. with residual 15-minute delays, according to Metro. The second crash occurred about 6 p.m. in the area of Avenue 54 and Marmion Way, according to Ramon Montenegro of the Sheriff’s Transit Policing Division. One person from the vehicle complained of pain, he said, but it was not immediately clear if that individual required a trip to a hospital. Trains were passing the area on a single track, Montenegro said. Metro reported delays of 15 minutes. ARCADIA – A man was struck and killed by a train approaching the Arcadia Station Thursday while standing on Metro Gold Line tracks, halting service for several hours, according to the sheriff’s department. The crash was reported at 12:12 a.m. near the Arcadia Station at 200 N. First Ave. The victim was pronounced dead at the scene, according to Ramon Montenegro of the Los Angeles County Sheriff’s Transit Services. His name was withheld pending notification of kin. “They were definitely in an area they were not supposed to be,” Montenegro said. The age of the victim was not immediately available, and there was no immediate explanation why that person was on the tracks. No injuries were reported aboard the train. Train service on one track was restored about 4:30 a.m. and full service on both tracks began about an hour later, Montenegro said. With nerves still rattled by an unfounded bomb threat targeting a Southland rail station Tuesday, the discovery of a discarded jacket on the Foothill (210) Freeway in Pasadena prompted a bomb squad response Wednesday, along with a commute-snarling freeway closure and the shutdown of an adjacent Gold Line station. A man whose name has not been released but who is suspected of throwing the jacket on the freeway was later arrested. The bomb squad was summoned shortly before 8:30 a.m. when something believed to be a suspicious package was spotted along the eastbound freeway median at Lake Avenue, adjacent to the Gold Line Lake station. Both sides of the 210 Freeway were closed down, creating a miles-long parking lot. Some drivers stranded on the freeway turned off their engines and exited their vehicles while they passed the time. “It’s become like a community out here,” one motorist told City News Service. With the Gold Line station closed, buses shuttled passengers between the Allen and Memorial Park stations. The sheriff’s bomb squad eventually sent in a robot to examine the item. The robotic arm was used to pick up the item, which turned out to be a jacket. Sheriff’s officials declared the item not to be a threat, and the freeway was reopened at about 10:45 a.m. The Lake Avenue on-ramp remained closed for a time, but finally re-opened around 11:10 a.m., according to authorities. Trains resumed normal service, but Metro officials warned passengers to expect residual delays for a while. LASD Transit Policing Division spokesman Ramon Montenegro told City News Service that cameras at the Gold Line station caught a man tossing the item onto the freeway near the station. The Pasadena Star-News reported that the man was taken into custody after struggling with deputies at the nearby Memorial Park station. The suspect is facing a charge of obstructing officers, but a background check revealed that he has $80,000 worth of warrants. “He (the suspect) may be facing additional charges,” Montenegro said. The disruption came two days after a bogus tip warning about a possible “explosive device” that would be detonated Tuesday at the Metro Red Line station on Lankershim Boulevard across from Universal Studios was phoned into authorities. That tip, made from a pay phone reportedly used to communicate bogus threats in the past, was relayed to the FBI Joint Terrorism Task Force on Monday morning and led to a massive law-enforcement presence at rail stations throughout the area on Tuesday. Authorities learned about the threat from someone in Australia who called a public safety line and provided information about the alleged plot. Commuters who rely on Metro rail lines were met with heavy security Tuesday as local and federal authorities responded to the tip. The Universal City Station was heavily fortified, with barricades and a throng of sheriff’s deputies and police officers wielding high-powered weapons. Investigators eventually found no evidence to corroborate the warning of a possible bomb, the FBI announced Tuesday night, but security remained elevated on the rail system Wednesday. 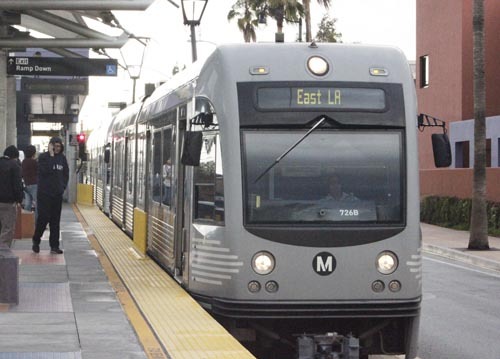 For more than a year, Metro officials have been conducting technical studies to fine-tune two proposed alternatives for Phase 2 of the Gold Line Eastside Extension, including taking a closer look at what it would take to bring rail service to the City of Commerce. Though there are talks that in the future both alternatives ¬– one along the SR-60 Pomona Freeway and the other traveling south to Washington Boulevard – could come to fruition, the City of Commerce is very interested in seeing the Washington alternative built first, Councilwoman Lilia R. Leon said during the Nov. 15 city council meeting. A Gold Line connection to Washington Boulevard would create the opportunity for stops near the Citadel Outlets or Commerce Casino, the two largest revenue generators for the city. “What we heard loud and clear was the idea of exploring a Metro connection to the Citadel,” said Eugene Kim, project manager for the Eastside Phase 2 Project. The two alternatives up for discussion have not changed much since they were presented to the public in late March. One possible alternative would extend the Gold Line 6.9 miles east – from where it currently ends at Atlantic Boulevard in East Los Angeles – along the SR-60 Pomona Freeway and ending in South El Monte. The second alternative would travel nearly 9 miles, providing a north-south connection from Atlantic Boulevard to Washington Boulevard, before traveling east to the city of Whittier. Metro plans to present the two refined alternatives to the public in spring 2017 and begin talking about reinitiating the environmental impact report process, according to Kim. One of the biggest challenges Metro officials face however, is selecting a route to get to Washington Boulevard, says Kim. Earlier this year, Metro identified Garfield Avenue, Atlantic Boulevard and Arizona Avenue as the three most promising routes for the connection. The two latter options would allow for a stop near the Citadel, but present challenges in the heavily congested area known as the Mixmaster, where Atlantic Boulevard crosses the I-5 Santa Ana Freeway. “Commerce is a very important partner in identifying ways to make that connection,” Kim said. Eastside residents and business owners have repeatedly expressed complained that under the current proposals their community would once again have to shoulder more than its fair share of the burden from transportation projects in the region, as it has done for decades. Many believe the Washington Alternative would benefit the Citadel and Commerce Casino at the expense of eastside residents forced to live through the construction. They claim eastside businesses would also suffer, just like they did when the Gold Line was first extended to the eastside along 3rd Street. “Someone is going to lose and someone is going to gain, but we haven’t done any of the gaining so far,” East Los Angeles Chamber of Commerce President Eddie Torres told the Commerce City Council during their meeting. Metro left “no stone unturned” when it considered 27 possible alternatives to reach the Washington Corridor, Kim said, but ultimately it will be necessary to cut through Commerce. Other potential challenges include routes that travel near Southern California Edison transmission lines, crossing a very active freight corridor and rail spurs that serve local businesses. “Without an alternative that has the support of the city, cooperation of city staff, it will be very difficult to identify a real viable Washington Boulevard Corridor alternative,” Kim explained. Metro officials are looking at designs that include aerial and underground stations to address the obstacles. An underground station in close proximity to the widely visited Citadel Outlets could be possible with a tunnel-boring machine, but that would require Metro to acquire up to 5-acres of land, Kim told the council. Metro officials are also looking for a 12- to 15-acre site for a maintenance facility to compliment the project. “Have you been looking at the city of Commerce,” Mayor Pro Tem Tina Baca Del Rio asked Kim. “We’ve been looking everywhere along the corridor,” he responded. Metro officials have not identified a specific area or parcel for the proposed facility, but back in October they took Commerce officials on a tour of a Metro maintenance yard in Santa Monica to give them a better understanding of what such a facility could look like if built in the city. The idea of building such a large facility, coupled with the tunnel-boring activity, has city officials concerned about what they see as the inevitable disruption to the city’s busiest commercial corridor. The city needs more details about what would go on “because we have a lot of activity around that whole area and those impacts need to be properly assessed, ” Councilman Hugo Argumedo said. Councilwoman Leila Leon was quick to point out that although a Washington route would serve the city’s major destinations, it is just as crucial to work with its neighbors. A boring machine dubbed “Angeli” began its underground journey Wednesday to create tunnels for Metro’s regional connector project, which will link up the Blue, Expo and Gold lines in downtown Los Angeles when completed. Metro board members, including Mayor Eric Garcetti, were on hand for a ceremonial lowering of the boring machine, which was officially named Angeli, the Latin name for angels. Will Rogers Middle School eighth-grader Windsor McInerny came up with the winning submission in a naming contest. Garcetti added that Angelenos will benefit from even more connections soon after another boring machine named “Harriet Tubman” completes digging work on the Crenshaw/LAX line, which will connect stations in Crenshaw and Inglewood to the Green and Expo lines. The $1.55 million regional connector project is scheduled to be completed in 2021, with Metro officials estimating it could shave off 20 minutes in traveling time for passengers. The full length of the line including above-ground portions will run a total of 1.9 miles, and include three new stations. Metro board Chair John Fasana, who is a Duarte city councilman, called the start of tunneling “a major milestone toward the completion of a vital project that truly connects the region by providing a one-seat ride to downtown Los Angeles for users of the Blue, Gold and Expo lines. “The Regional Connector will reduce travel times for many Metro rail riders and make our system much more convenient and attractive to those who want a transit alternative to driving,” he said. A woman was recovering this morning after she was struck by a Metro Gold Line train when she got too close to the tracks in Boyle Heights because she was trying to take a photograph, according to authorities. It occurred at 1149 E. First St. and was reported at 10:10 p.m. Friday, according to Los Angeles Fire Department spokesman Brian Humphrey. The unidentified woman was taken to a hospital for treatment of non-life-threatening injuries. No one on the train was injured, Humphrey said. The incident was being investigated by the sheriff’s Transit Services Division. In 2008, Los Angeles County residents took a leap of faith and voted to raise our county-wide sales taxes to fund the construction and maintenance of our transportation infrastructure. Seven years later, Metro conducted a quality of life report to study the impact of that decision on the region. The results are impressive. New rail and bus rapid transit now provides access to more than 300,000 jobs in the region. Nearly 500,000 residents now live within a half mile of projects that opened after passage of Measure R. What’s impressive is that this data was tallied prior to the 2016 openings of the Gold Line extension and Expo Phase II. For these two reasons, along with the tremendous congestion we all experience every day, the L.A. Area Chamber Board of Directors has voted to formally support Metro’s Traffic Improvement Plan (tentatively Measure M). This ballot measure will add another 1/2 cent sales tax to our infrastructure investment and generate an additional $860 million a year for transportation projects in every city and unincorporated region of L.A. County. Major projects include an LAX Airport Connection, Gold Line Foothill Extension to Claremont, Westside Purple Line Extension to Westwood, Orange Line conversion to light rail, a transit route through the Sepulveda Pass and more than a dozen highway improvement projects throughout the County. The plan earmarks more than $4 billion in funding for our vital goods movement corridors and will return 17-20 percent annually to cities for investments in local roads and neighborhoods. It also increases oversight and implements a comprehensive review process every decade to make sure our dollars are going to the projects that make the most sense for the region. As the largest business organization in L.A. County, the L.A. Area Chamber is dedicated to improving mobility and job opportunities for our residents. A modern transportation infrastructure is the foundation for both. The November general election ballot will be packed with numerous state and local measures, but none will impact your day to day life in L.A. County more than this Traffic Improvement Plan. I urge you to vote yes on this transformative measure on Nov. 8. And that’s The Business Perspective. The Business Perspective is a weekly column by Gary Toebben, President & CEO of the Los Angeles Area Chamber of Commerce, produced with the input of Public Policy staff. Variations in the plan to extend Metro’s Gold Line Light Rail down two of the busiest streets in East Los Angeles would further divide a community that has for decades already shouldered more than its share of transportation projects in the region, eastside residents told Metro officials Tuesday. “Every community must share the burden of traffic,” said Martha Hernandez, who last year advocated against a light rail being included in plans to alleviate traffic congestion between the 710 Long Beach and 210 freeways, from East Los Angeles to South Pasadena. “East L.A. has no more land to share,” Hernandez said firmly. The Eastside Transit Corridor Phase 2 project aims to extend the Gold Line east from where it currently ends at Atlantic Boulevard in East Los Angeles. The two alternatives Metro is considering include a light rail line along the SR-60 Pomona Freeway that ends in South El Monte, or a north-south connection to Washington Boulevard, which would then travel east with a final stop in the city of Whittier. Both proposals are similar to the alternatives presented nearly two years ago to residents and the business community, but have now been tweaked to reflect comments received from the community and regulatory agencies, according to Eastside Phase 2 Project Manager Eugene Kim. Road in the city of South El Monte. The cost for this plan is estimated at $1.3 billion. The Washington Boulevard alternative now includes Arizona Avenue, Atlantic Boulevard and Garfield Avenue, three variations for the north-side connection to Washington Boulevard in the city of Commerce, with a potential stop at the Citadel Outlets. The route would travel 9.5 miles and is estimated to cost up to $1.7 billion. Metro officials pointed out that unlike two years ago when an aerial rail line was proposed, an underground subway would be used for the new Garfield route. Kim stressed that no determination has been made on whether the light rail would travel at grade, above grade or below ground in the Arizona and Atlantic variations. Metro has hosted public meetings on the revised plans in East Los Angeles, Montebello and Whittier. An additional meeting will be held Thursday at the South El Monte Senior Center at 6pm. On Tuesday, the Washington Boulevard alternative proved to be the most controversial for attendees at the meeting at the East Los Angeles Library. Many of the participants recalled how business suffered when the Gold Line was first extended to the eastside along 3rd Street. To this day, many in the community to this day say the community and businesses have still not recovered. “Our businesses will suffer, our kids will suffer while Montebello or Commerce benefit,” complained East L.A. resident Raul Daniel Rubalcaba. Meeting participants, from East L.A., South El Monte, Montebello, Pico Rivera and other areas were broken up into small groups where they discussed possible benefits and their concerns for each of the alternatives. What came across loud and clear Tuesday, was East L.A. residents do not want a light rail that travels above ground. “If a subway is good enough for the people on the Westside, it’s good enough for us,” said Clara Solis. Most cited the loss of business among their greatest concern. “We don’t want to transport our customers to the Citadel or The Shops at Montebello,” said Eddie Torres, the owner of a sign company and member of the East Los Angeles Chamber of Commerce. If the Washington Alternative moves forward, argued Torres, the Citadel and Commerce Casino would be the winners in the long-run, while eastside residents, forced to live through the construction, traffic and noise would be negatively impacted for the rest of their lives. “I’ll be dammed if I help send business their way on my grass,” Torres said. Ben Cardenas, president of the Montebello Unified School District and assistant city manager for the city of Pico Rivera, told residents at his table that the community should really be advocating for both alternatives, something Metro is also considering. He said another light rail could bring a new tax base to the eastside community, but only if riders get off and shop. “These streets are already congested, the alternatives would just kill business,” countered Lily Hernandez. Opponents of the SR-60 alternative pointed out the list of regulatory agencies that could complicate efforts to move forward. The SR-60 alternative travels near the EPA Superfund site, Southern California Edison transmission lines and near a flood control basin at Whittier Narrows. The north side variation could prevent any plans for widening the Pomona Freeway in the future, they argued. Nothing has been set in stone, representatives for Sup. Hilda Solis and Metro assured residents. “Before recommitting to an environmental process we want to get feedback from the community again,” Kim explained. Kim told EGP the agency has allocated $1.7 billion in Measure R funds for the project. He said the board is looking to allocate additional funds if voters approve a new transit sales tax in November. Rubalcaba pointed out that when the Montebello residents and business owners complained two years ago that an above grade or at grade route would devastate their community, Metro listened and came back with a less intrusive option. He told the East L.A. residents in the room it was their turn to unite and demand what they want instead of allowing transportation projects to divide their community any further.